I recently made this Chinese New Year cookie, 'Kuih Bangkit' for my daughter to bring back to Melbourne. As Chinese New Year is barely a month away, thought it best to post it now, perhaps you may like to try it out. These cookies are not too sweet, with a tinge of pandan fragrance coupled with a sweet taste of coconut ...... yummy. They do keep well if they're thoroughly baked and they melt in the mouth! I used these wooden moulds to make the 'Kuih Bangkit', handed to me by my mum ....... skilfully and beautifully hand crafted! The tapioca flour is fried in a wok, on low heat, with fresh pandan leaves, cut into 3 inch lengths, stirring all the time till the tapioca flour is light ..... takes about 45 mins. or more. Then discard the pandan leaves, sift the flour onto a pan and let cool for about 3 or 4 days till it is absolutely cooled. The creamed mixture of icing sugar, shortening and egg yolks is mixed with the sifted flour to form a dough. The cookies are knocked out from the dusted wooden moulds, placed on a baking sheet ready for baking. Baked 'Kuih Bangkit' fresh from the oven..... the whole kitchen is filled with sweet aroma of coconut and pandan ..... have used some red food colouring to dot the eys of the rabbit, bird and chicken! Kids will definitely love it! I prefer to bake them to a slight tinge of brown ..... so that they can keep longer. Aren't they pretty ....... Why not try this for Chinese New Year! In a wok, on low heat, fry the tapioca flour with the pandan leaves till the flour is light and the pandan leaves crispy. Discard the leaves and sift the flour onto a pan to let cool for a few days. The flour must be cooled thoroughly. Cream the shortening with the icing sugar and egg yolks till light and creamy and the sugar is totally dissolved. Add in about 100 ml coconut milk initially, cream thoroughly. Sift the tapioca flour onto a mixing bowl, add in a pinch of salt, then the creamed mixture and slowly knead till the dough does not stick to the hands, adding in coconut milk little by little when necessary. Cover the dough with a damp cloth and let it rest for about 30 mins. Dust the wooden moulds with some tapioca flour, pinch off some dough and put it into the moulds, cut off any excess. Knock out and place the cookies onto a baking sheet. You can place them near to each other because they hardly expand. Bake in a preheated oven @ 180 deg. C for about 20 to 25 mins. Cool completely on a wire rack before storing them in a cookie jar. 1. If the dough is too dry to handle, add in a little bit of coconut milk to make it pliable. 2. You'll need to fry excess tapioca flour as you require some to dust the wooden moulds. 3. 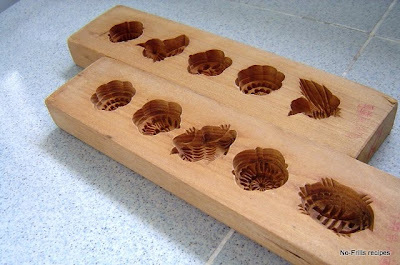 If you don't have the wooden moulds, you can roll out the dough and cut with cookie cutters. Wow....they look fabulous! I wish I can have some. I have all the moulds but never used. These little cookies tastes most delicious. Used to eat them when I was back home. But then I'm not one that has patience for little things....hmmm. I better go to you for them. I'll eat my heart's out :P Or maybe I should bribe my girls to make them. I love kuih bangkit, they remain me of Chinese New Year! Oh wow, you're doing this for real. Getting ready for the CNY huh! ME too! Really excited. haha... These kuih bangkit really beautiful. Well done, Cheah! I love kuih bangkit. This is one cookie that I can never get it right. It is always too hard. Thanks for sharing the recipe and I might try this out for CNY. Actually, I've been keeping these moulds and only last year did I start using them. It can be quite tedious making them alone, but then try out half recipe first. If your girls were to help you, then it's easy. Yup, CNY is just round the corner. What type of cookies will you be making? If you are anywhere near Ipoh, don't mind passing some to you! Maybe you put in too much sugar. Try this out. I really love this~melt in the mouth cookies. Thanks for sharing this recipe. wow, beautiful molds and cookies! i've never seen these before, but i would love to try them and see what they taste like. I can't believe chinese new year is almost here! Your daughter is very lucky to be able to carry your yummy love and cooking back home with her! Ya, it's one of those Chinese New Year cookies popular in Malaysia and Singapore. Yes, time really flies. That's what we mothers are, always thinking of the children! They are a work out of art. I can't remember having this before or maybe I actually did. What a great gift too. Maybe it's not popular in the Phillippines, but I do remember eating this when I was very, very young. My grandma used to bake this using charcoal in an earthenware pot and placing a zinc sheet over it. There was no oven those days and we had to help knock out those cookies. It was fun though. Hi Cheah...I have been looking for a good kuih bangkit recipe. And thanks for sharing it. I dun have the mould like yours. Can I use a cookie cutter? Yours looks great...so dainty the design...real classic! I've made this 3 times already and they're good. Yes, you can roll out the dough and use a cookie cutter. My moulds are antique, ha, ha! Hi, my 1st time here, I was linked to here by Elin who told me you have a success kuih bangkit, I have been looking for one. Thanks so much of sharing. By the way, can I replace shortening with margarine? Thanks for dropping by. I've never tried with shortening, but I think if you use margarine, the kuih won't be so white, but a bit yellowish, which in my opinion is not authentic. Oops ... typing error re above reply to Sonia. It should read 'Ive never tried with margarine'..
Wow, these are the most beautiful Kuih Bangkit I have ever seen! Thanks for the kind compliment! Nice of you to drop by! hi,just wanted to ask you, how many does this recipe make?thanks! The cookies were quite small, I managed to get 1 medium and 1 small cookie jars of cookies. Didn't really count how many and also it depends on the moulds you're using. If you don't have the moulds, you can use a cookie cutter and again it also depends on the thickness of the dough. Yes, try with cookie cutters first, then only invest in the moulds. Do let me know how it turns out, enjoy receiving feedbacks! 1)when you "fry" the flour, how do you know when it's done?i "fried" mine on low heat, for close to an hour, at one point it was sort of light and fluffy but after that it became almost dense and smelled like caramel.at that point i stopped.and my pandan leaves started becoming brittle.did i leave it too long? 2)i cooled mine for a day outside and then put it in the fridge for less than 24hrs before using it.should i have left it longer? 3)should i have lowered my temp/cut off baking time to make it less crunchy? 1. I fried the flour till light, you can sort of feel that it's light, pandan leaves just turn brittle, switch off fire. One question here, what type of utensil did you use? Wok or non-stick pan? 2. I left the flour to cool, on the table, covered with a plastic food cover, for 4 to 5 days. Didn't put in fridge at all. 3. Your baking sheet/tray is it non-stick? Mine is the alluminium tray. Non-stick tends to absorb heat because of the black colour and I suppose the bottom will brown faster. If baked too long, tends to be crunchy. i used a wok, maybe i fried too long/too short the time.but it was on very low heat to the point that if any lower it will turn off hehe.and i waited till the pandan leaves were brittle.but i notice that the flour is not as white as original flour. i used aluminium tray, you know the kind that pasar malam people use to display their kuihs/agar-agar in?not a cookie sheet. my husband said that the taste is there, but it doesn't melt in his mouth.usually if kuih bangkit it almost starts to melt as soon as it enters your mouth right?does your turn out this way? oh sorry, one more thing to ask, when you say cream the santan with the icing/shortening/yolk mix, how?it is almost impossible for me to do it because the fat just won't stick to the santan.so can i just mix the "sugar paste" into the flour before adding santan bit by bit?do you think box santan would have a different outcome?i used fresh santan. 1. Frying with the wok is ok, I do too and after frying the flour will not be as white as originally. 2. You should use a cookie sheet, with no upturned side like a cake pan so that the heat will be evenly distributed. 3. Yes, they melt in the mouth and I have other fellow bloggers who've tried the recipe and were successful. 4. You can cream the icing sugar with the shortening and egg yolks just like how you cream butter and sugar in cake making using a whisk or a mixer. You can see from my picture that it's wet before you add into the flour and then only slowly add the santan. 5. No, don't use the box santan, use fresh one, the box santan has a smell which is not pleasing. Whenever possible and if you can help it, use fresh santan. I fried the flour 2 days ago, but only for 35 mins. I believe it was lighter but there was no color change. still as white as before. The pandan leaves were crispy. Do i need to re-do them? Also, I have a non stick baking sheet. Please advice me on when do I need to line my sheet with parchment paper? Do I still need to butter and flour on top of a parchment lined tin? I cant seem to find the balance between burning the bottom of my cookies and not allowing it to stick to the pan. I will be making my pineapple tart filling soon (your recipe!) Will let you know how it turns out. The flour is still white after frying. No need to re-do, but must leave it to be completely cooled. Discard any remnants of pandan leaves otherwise the specks will spoil the colour of your biscuits. I suggest that you line your non stick baking with parchment/baking paper. No need to oil at all. You can check out the above website re parchment paper. Thanks for dropping by. Glad you liked the recipe. The recipe states to use 450g tapioca flour. Are we supposed to weigh 450g tapioca flour to fry it or to fry a big pack of flour and then weigh 450g for use? No, you should fry more than 450 gm of flour, say about 250 gm more, because the flour once it's fried, will be lighter. Moreover you'll need extra flour for dusting the moulds. Alternatively you can choose to stamp out the cookies with a cookie cutter. I just made these again, and this time the taste, the crunchiness, and the degree it melts in your mouth are perfect! However, quite a number of my cookies cracked really bad (I used a cookie cutter). I believe it stems right from the texture of the dough itself. Initially, I kneaded the dough, and added enough coconut milk till it was not sticking to my hands. When I tried to roll it out, it was difficult to get a handful of dough to stick to each other (as if I'm making a ball before I start rolling). When I added a lil' more coconut milk, the dough became even harder to work with as it was sticking to my rolling pin. Aesthetically, 70% of my cookies cracked and some looked really terrible, but the taste, and texture AFTER baking is perfect. How do I improve on this? Thanks for the recipe, once again! I've never tried this with a cookie cutter but once the dough didn't stick to the hands, then it should be easy to roll out. Put the dough in a plastic bag, roll out, then cut open the plastic bag and cut up the dough with a cookie cutter. You can also dip the cutter into some cooked tapioca flour before stamping. This way the dough will not get stuck onto the rolling pin. Yes, these cookies tend to crack but doesn't really matter. You've a very nice blog, love it. Will like to ask you a question, after frying tapioca flour, then weigh the exact 450g tapioca flour, is it correct? Thanks for dropping by. After frying the tapioca flour, let cool completely, then before you want to make the biscuits, then you weigh out the amount. The balance, keep it for dusting the moulds. Sometimes you may need to add in more tapioca flour. Thanks for your quick reply, will try out. Baking is different from frying. When we fry we lift up the flour and then can determine whether it's light enough or not. I've never tried to bake the flour, so I can't comment. Thanks for sharing your wonderful receipe. I would like to make a larger portion, can I just double the ingredients? Does a different brand of shortening affect the texture of the dough making a difference to the taste? Hi, you can double the recipe for more cookies. Don't think a different brand of shortening will affect the texture and taste to the cookies. Thank you very much for sharing this recipe. I had great success with it after many failed attempts with other recipes I found online. They are my hubby's and son's favourite cookies. Texture is crispy on the outside and melt in the mouth inside. Just one question, can I reduce the amount of sugar without jeopardising the texture of the cookies? Sorry for the late reply. I think reducing the sugar a bit won't do any harm to the texture of the cookies.